Whether your personal style is more rustic and cosy or modern and spacious, you are sure to appreciate today’s homify 360° discovery – and in case you were wondering, this highlight is indeed the latter (modern and spacious). 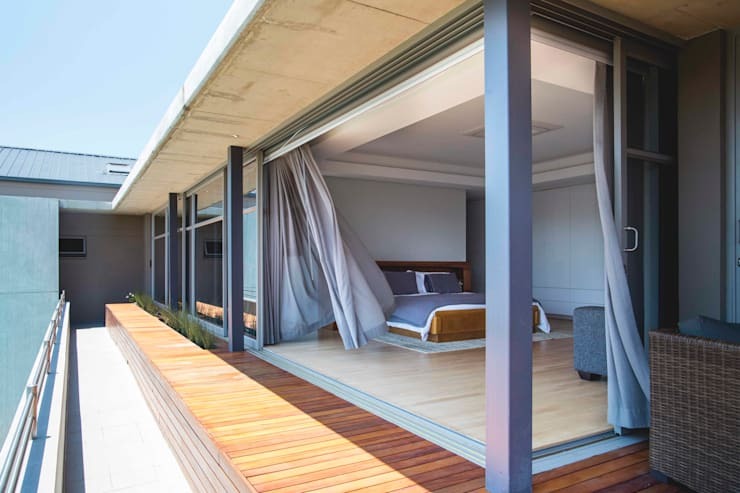 Pretoria-based team Swart & Associates Architects took control of this project, which sees a modern house pull the rug out from under you. 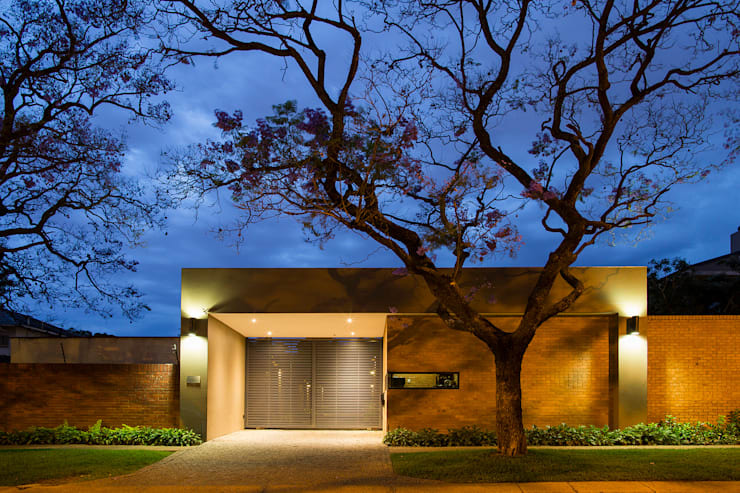 That’s because its front façade, although still stylish, looks rather modest and subtle, with no clues revealing just how spacious this house truly is. 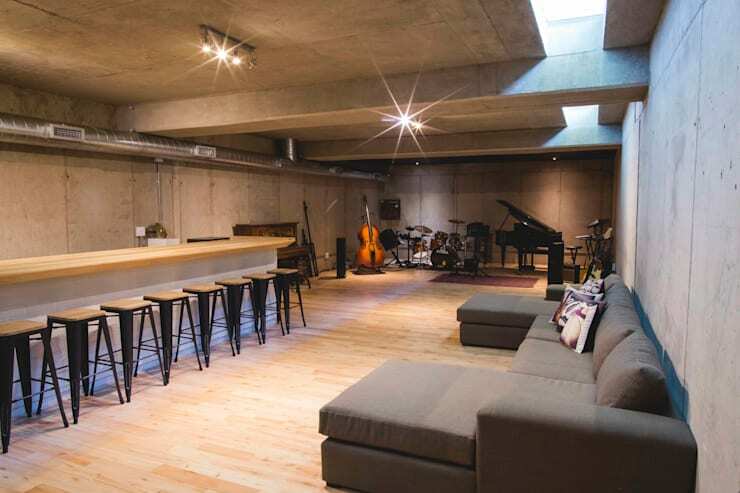 We’re talking a basement dedicated to socialising and playing music! See? A straightforward design with bricks, steel and concrete, with a neat little garden trimming in the front for a touch of freshness. Who would have ever guessed that behind those brick walls lies hidden quite the enormous modern structure? We knew you wouldn’t be able to wait any longer, that’s why we immediately zoom in on the basement/underground level which is committed to socialising and music. Wood and concrete both present a clean, rather industrial-like style here, joining forces with a neutral colour palette. We certainly wouldn’t mind dreaming in here! This upstairs bedroom is located in a corner space, where gigantic glass doors slide open magnificently to reveal the great outdoors (past the wooden deck meant for exterior seating and relaxing, of course). “Unique” is right – how often do you see a bathroom with this type of look or layout? A tub has been built right into the wooden floor (does it have something to do with lowering stress levels, perhaps? ), while twin glass-door showers complete the look in the background. And of course we can’t overlook the wall in the middle of the room with the built-in fireplace, or the wall-mounted television on the left. Last but certainly not least, the tremendous back yard, where we also get a stunning glimpse of some of the house’s other rooms. An open-plan layout allows the living room, dining area and kitchen to share a seamless space, which also opens up beautifully onto the terrace and garden/yard. 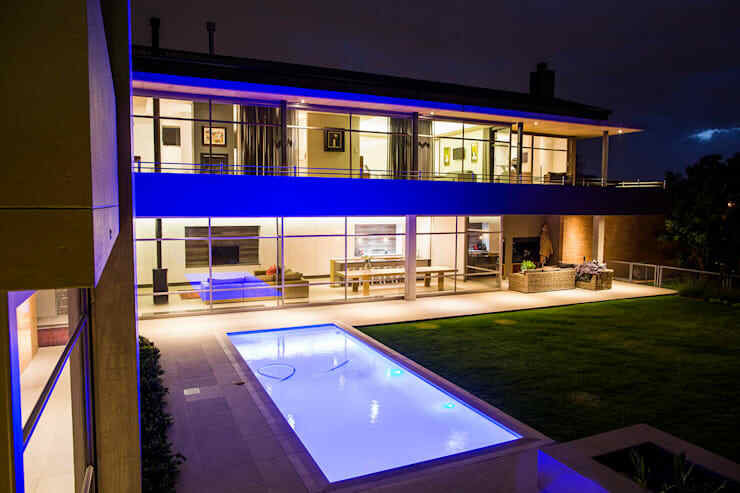 Purple-tinted lighting goes a long way in adding a touch of magic to the yard, especially that swimming pool – a clear signal that this house is ready for some serious socialising. Seeking something a bit more modest? 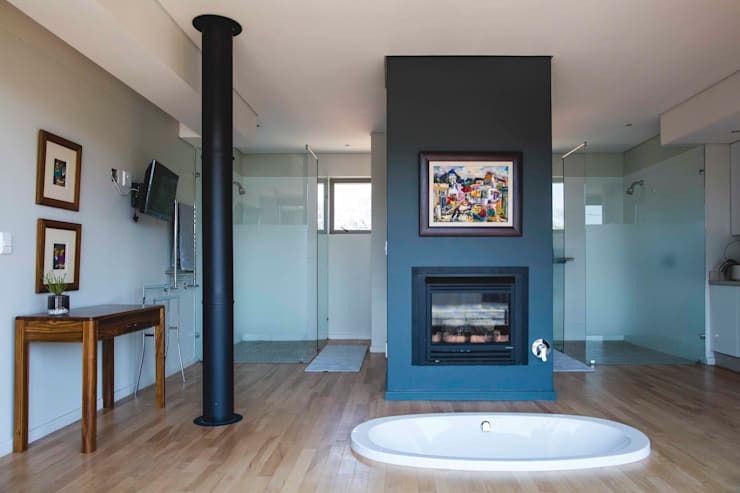 Try The Cape Town family home with unbeatable style.